The security forces' violent crackdown on nationwide protests in Zimbabwe last week was met by deafening silence from the country's neighbours and the Southern African Development Community (SADC) regional block. Following President Emmerson Mnangagwa's sudden announcement on January 12 of a 150% fuel price increase, the Zimbabwe Congress of Trade Unions labour movement called for a three-day national strike, which triggered the protests. Protesters burned a police station, barricaded roads with large rocks, and looted shops in Harare, Kadoma, and Bulawayo. Government security forces responded with live ammunition, rubber bullets, and teargas, which they fired at the protesters and into people's homes. When South African President Cyril Ramaphosa finally spoke out about the situation in Zimbabwe on Tuesday, many expected him to censure Mnangagwa over the deaths of at least 12 protesters, the arbitrary arrests of hundreds of people, the two-day internet shutdown, and other abuses.Yet Ramaphosa did not address these concerns and instead called for the US government to remove sanctions on Zimbabwe and announced that he would soon be meeting with Mnangagwa. At the heart of Zimbabwe's economic problems is its $17-billion domestic and foreign debt. Zimbabwe has been unable to secure new loans from the International Monetary Fund (IMF) and the World Bank because Zimbabwe defaulted on existing loans from the IMF and World Bank. In its 2018 elections manifesto, Zimbabwe's ruling ZANU-PF party promised a raft of reforms meant to help mend strained international relations and allow the country to re-engage with international creditors. Yet the government has failed to carry out critical reforms, which could lead to both a lifting of targeted US sanctions as well as re-engagement with international creditors. Ramaphosa should ask Mnangagwa to ensure that Zimbabwe's security forces cease abuses, that soldiers return to their barracks, and all those responsible for killings and other abuses be held accountable. On January 22, on his Twitter account that, "the violence or misconduct by our security forces is unacceptable and a betrayal of the new Zimbabwe." But so far there has been little, if any, accountability for the continuing abuses, making his words ring hollow. 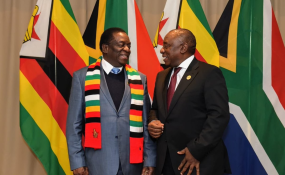 Drawing on former president Nelson Mandela's 1994 declaration that, "human rights will be the light that guides our foreign policy," Ramaphosa should urge the Zimbabwe authorities to take clear, decisive measures to honour the country's human rights obligations and ensure the protection and promotion of fundamental freedoms for the benefit of all Zimbabweans. A firm stance on Zimbabwe will help to restore South Africa's human rights leadership on the continent. If South Africa moves forward with a bailout package for Zimbabwe, it should be conditioned on the Zimbabwe authorities taking clear steps to put in place measures to ensure transparency and accountability for public funds. The violent crackdown on protesters severely undermines the government's efforts to reposition Zimbabwe as a rights-respecting nation. This is the message that Ramaphosa should frankly deliver to Mnangagwa, instead of a sanctions red herring.